Elizabeth was looking for ways to control blood sugar, primarily for her diabetic mother. For one of them the story ended happily. I want to share my success story with this wonderful low-carb eating habits. My mother got gangrene on her second toe on the 12th of Oct 2014, she had type 2 diabetes for 30 years. I was so eager to know how to cure gangrene, how to control blood sugar, and how to cure diabetes. Your interview on YouTube came to me, even though my mother does not speak English, but I translated into Mandarine. So I got my mum to eat low carb to control her sugar. I wanted to do it with my mum at the same time, so I want to show her it is possible to be healthy without eating noodles, rice and bread every day. So that is how I started to change eating habits. Between Nov 2014 to Jan 2015, I have lost roughly 33 lbs (15 kg). I was 176 lbs (80 kg) and now I am 139 lbs (63 kg). I wish that I had known low carb could reduce blood sugar many years ago, so that I could have let my mum try low carb. She might have controlled her sugar better before she got gangrene. She might not have passed away on the 13th of Feb 2015, due to a heart attack. In these 2 months, my mum’s sugar level was controlled very well without medication, but gangrene spread so fast. 9 days later she passed away after she had a stent done on her leg. I tell people I meet who got diabetes, to see info on your website, changing to a low-carb diet. Do not wait for any complications to start, that would be so late. Start to eat low carb today, that can save your life, get you a healthier body, mind and energy. Thank you very much for spreading the word to those diabetes patients. This is a sad story as it turned out to be too late to save Elizabeth’s mother, even though her blood sugar control was much improved on low carb. 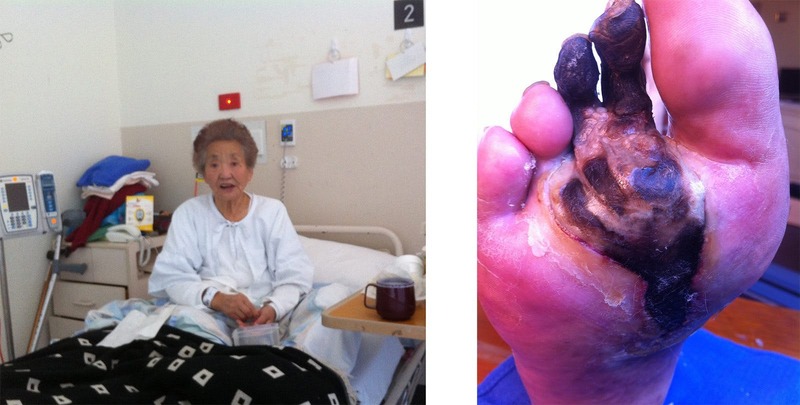 She already had gangrene due to severely damaged blood vessels to one of her legs (a common long-term complication in diabetes) and unfortunately it kept spreading and she did not make it. Had her mother had better assistance from her doctors with a lower-carb diet, many years earlier, things could have turned out very differently. Obviously a daughter should not have to look for that help by herself on the internet, in another language. It’s truly a shame that it was necessary. The happy part of the story is that Elizabeth will now hopefully never have the same problems, never even get diabetes in the first place. Having quickly lost 33 excess pounds is a great sign. And hopefully her story can inspire many more people. I'm so sorry for Elizabeth and her mother. This is truly sad and preventable, if only the right information were disseminated. We certainly have the information available, but the forces that want to retain the status quo are very strong. This must have been a sad and heartbreaking time for the whole family. I must confess that the photo is quite disturbing, and I really could have done without it. Also, Elizabeth's mother might not have liked to have this part of her story long after her death. I understand that some people need a "jolt" to make real change, so others may disagree. I think that the story would still resonate. I've been on this LCHF diet for 1 month, lost 8 lbs. Not a lot but then I'm on Lithium for my Bipolar which is making losing weight hard as it affects the thyroid. Cutting carbohydrates isn't an issue, I went from over 200 gs a day down to 20 or 30 gs; my problem is sodium, so I've had to replace my salt shaker with a salt substitute. I keep forgetting to rinse my canned food so I don't exceed the 1500 mgs sodium recommendation for people 50 and over (I'm 52), and while I'm upping my potassium I cannot quite meet the 4700 mgs recommended even when adding spinach, broccoli to my diet (my only vegetables with cauliflower). My blood sugar is under 200 mg/dL (was over 300 mg/dL) and I don't have to take insulin, just move a bit and lower the carbs from 20 gs to 15 gs or even 10gs. I am even flirting with 0g for a while but I don't want to give up my broccoli and cauliflower. I've discovered Chia Seeds too, which helps fill me up and hopefully lower my numbers and it has 0-1g net depending on brand. Hopefully in the next month, I'll have lost more weight. I'm not sure why you try to follow an extremely low sodium diet, especially this much out of balance with potassium. On the other hand be careful with lithium, as it can destroy kidney function rather easily. On the right-hand side, there are two articles about salt. These echo what's on the "eathropology" site. Thanks, Elizabeth for sharing your story. I'm sure it was a considered choice to share or not. As a long time diabetic, I've seen and read about many terrible complications of diabetes. Even so, I know that a sharp reminder is needed by me to bring the dangers of the disease into focus. It is not needed frequently but yes, it can be helpful occasionally. Also, my condolences to you about our mother. Yeah, I don't worry about sodium and I'm 64 years old and had diabetes for 49 of those years. But I do keep two salt shakers on my kitchen counter. One is sodium based sea salt and the other is potassium based Nu Salt. I switch back and fore between the two mostly because I think my potassium consumption is low. Thanks for your story Elizabeth. You look great, stay strong. these are my recent blood works. Does someone know if good or not? is the insulin resistance gone? Should I raise carbs again? A bittersweet ending; my condolences to you, your family and friends whom lost a loved one. Congratulation’s on your weight loss and I truley hope those you tell your story too really hear/listen to your message and will decide to make a positive change in their health. Elizabeth thank you for sharing! Insulin shall be 25 or less.. so 11 is good.. no hyperinsulinemia. Normal C-peptide is 0,5-2.. 2,3 indicates more insulin.. but it could be the deviation in acuracy. HOMA- IR seems to be best with 2,5.. 2,1 isnt that bad. And all those values is indications.. not the whole truth. HBA1c 30 is good.. its low. Tot/HDL = 206/40=5,15.. it should be 6 or less, better if its 5 or less, excelent if its 4 or less. Its your HDL thats low.. indicates metabolic syndrome. Trg is low and good. D-vitamine is very low.. take some substitutes.. and buy those whit K2 in it! D3 activates calcium absorbation and circulation.. K2 make it go to your bones and theets. So it dont end up in your arterys or heart. should I add carbs after training? You know.. Insulin in blood have a halftime of some few minutes.. so it dont say that much. This 11 means probably moste that you eats LCHF, HBA1c 30 says the same thing! C-peptide is a rest from making insulin from Proinsulin.. it have a halftime of some hours.. it says more about your mean insulin level over som hours. HOMA-IR altso indicates some IR! Low HDL and central obesety togheter with the rest says metabolic syndrome! Its the same whit me.. I did lose some weight but the beer bellly is stubborn! And its not frome beer anyway.. I dont drink beer.. its probaly genetics, age and a western lifstyle? Well if you tryes to compete for the olympic team I think you can ad some carbs.. otherwise eat proper meals when hungry! but I thought carbs after workout is good for the muscles?! and too much fat is also bad? Carbs after elit excersise whit a lot of anaerobic excersise.. is for depleted the glycogen depoes! It saves the muscles.. but I think its not your case? It cant be to much fat whit 1300 Kcal? The best advice to unknown people is to folow ones apetite.. and learn to listen what your body is trying to tell you.. and to neglect those signals that says high blood sugar! I dont think its nutrition.. you probably alredy eats at a proper way.. its more about genetics, age and a westen lifestyle? no but will the muscles grow or even get smaller if I dont eat carbs? I know protein is important but also carbs to get the nutrition value to the cells right? what are the glycogen stores even for!? usually its 1300kcal.. but I also eat much protein than fat right now..
can I stay low carb indefinetely?? what about testo and thyroid? No, not if you dont excersise like one how compete for the olympic team! They need about 5000 Kcal a day.. to not vanish! There are no essentiall carbs.. and your liver can make up to 100 gram a day.. if its needed. Its those persons that use that much glycogen that can benefits frome eating more carbs.. preferely for long time anaerobic excersise. You have glycogen stores in liver and in muscles, about 100 gram in liver and about 300 gram in muscles. Those stores in muscles is for muscle use, hard anaerobic use, like hard labor, or for fightand flight. Those in the liver is for holding a nice blood sugar, mostly for red blood cells, gonads, small parts of your brain and kidney. Keep the protein and up the fat.. preferely fatty meat, salmon, eggs, pork, avocado. Yes one can stay low carb indefenitely.. some even need to do it. A high fat diet seems to rise testosterone if anything and it affects the thyroids like that you dont need that much active T3 anymore. Your testo wasnt bad.. mine is lower.. on the lower limit. High active T3 is one of the signs of prediabetes.. its needed copius amounts of active T3 to handle a high blood sugar. Some day I would like to see a South Africa-style Truth and Reconciliation Commission for all the doctors and dieticians who counseled diabetics to eat plenty of carbs to go before the public and atone for the years of life they robbed from their patients. Maybe some day? To Elizabeth I send condolences. I lost a grandfather and a great-grandfather in the very same way; my grandmother died from related complications. I hope Elizabeth spreads the word in Mandarin as far and wide as she can so that more senseless death and suffering can be prevented. A tip for those with elders in care: make sure you check your mother/father's feet regularly. Give them a little foot massage. And if there is an in house beauty parlour? Send your loved one once a month for a pedicure. That way, there will be foot care and examinations. You can't count on nursing staff anymore, sadly. If you are going to comment on this website, you should have already read much of the information on the website. It is inconvenient for all of us who are familiar with the website info that you are having this discussion about what you think are your body's needs for carbs when this is so eloquently discussed on the website in numerous places! Read that before commenting please.